Even when water falls from the sky, life must go on. Errands need to be run, meetings need to be met, and dates need to be dated. To help make daily tasks in dreary weather a breeze (and even fun), Columbia offers the affordable Arcadia II rain jacket (or Watertight II, if you want the men’s version). Due to the entry level cost, decent waterproofing, and trusted brand, we have awarded the Columbia Arcadia II the Budget Pick for Urban Hikers. Designed for urban hiking, the Columbia Arcadia II is a lightweight, affordable rain jacket made of patented technology that magically repels dirt. The seams are fully sealed and the flexible material gives this rain jacket a more urban feel. It is a worthy piece of gear when living a busy, wet life that transitions from work to commute to nature on the fly. If you’re curious (or lost) about rain jackets, check out our comprehensive Guide. 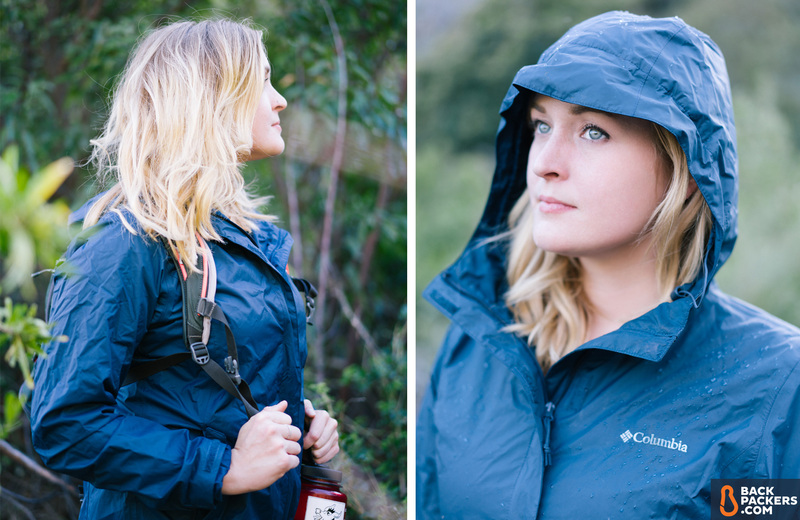 Below, you’ll see why the Columbia Arcadia II is an excellent budget go-to for rainy days. Update: We reviewed the Columbia Arcadia II in 2017. The Arcadia II is a staple budget women’s rain jacket for Columbia and has not received any major updates. Colors change yearly. Weight 10.7 oz. (303 g) This weight is for a women’s medium. Lightweight, all things considered. Layer 2-Layer 2-Layer jackets are the lower end. They have a mesh lining inside to help keep off sweat, and don’t breathe great. More information on rain jacket layers in our Guide. Waterproof Membrane Omni-Tech Waterproof Omni-Tech is Columbia proprietary membrane for rain jackets. It helps with waterproof breathability, two elements that are decent (but not great) in this jacket. More information on rain jacket membranes in our Guide. Face Fabric 100% Nylon 2L Full Dull plain weave Basic exterior fabric. Repels water and dirt, but stays crinkly and is noisy when moving around. Lining Material Mesh This jacket uses a mesh lining on the interior instead of a true layer. This helps with breathability some, but mostly cuts down on cost. No. of Pockets 2 hand pockets Easy to access hand pockets with zippers. Pocket Placement Casual Not meant for hip belts, these pockets are best suited for casual use. Pit Zips/Vents No This jacket is not meant for high exertion activity, and doesn’t have features like pit zips or vents because of that. Water Resistant Zippers No Basic zippers, though they work well. Storm Flaps Yes Large storm flap secured with velcro down the main zipper and hand pocket zippers. Helps to keep water out. Packs Into Itself? Packs into hand pocket Easily stuffs into its own hand pocket. Perfect for stashing when on the move. Hood Adjustable Basic hood that’s adjustable with two toggles near the neck and velcro along the back. Does not have a stiff brim, but hood is pretty deep. Toggles are not made very well. Fit Classic/Boxy Built with a boxy shape, the fit is what people call Classic these days. That means there’s plenty of room to layer underneath, and the coat is a little big. Seams Fully sealed Solid seals to keep water outer. Manufacturer Warranty Manufacturer’s Warranty Columbia doesn’t specify their full warranty information. You have to submit your claim to get the right information. Hopefully they will fix manufacturer defects and workmanship within a year of purchase, hard to be 100% sure. Retail Price $90 A reasonable retail price, but the Arcadia II and Watertight II (the men’s version) are often on serious sale. See prices for both rain jackets below. After many parched, drought-consumed years, California received ample rain this past winter. The earth was able to rehydrate, people were able to take longer showers with less guilt, and I was able to test out the Columbia Arcadia II rain jacket. Since the rain did not qualify as a valid reason to skip out on my responsibilities, I relied on the Arcadia II to help me stay dry while I ran errands, met with clients, and hiked. While I am an Urban Hiker out of convenience, I’m also a Wilderness Backpacker and Day Hiker junky. So, naturally, I had to test the jacket in extreme rainy conditions. What if I got caught in a torrential downpour while trapped under three storm drains as an elephant sprayed me with water? One must know how their gear will react under severe and highly unlikely conditions, right? The Arcadia II beading rain off like a boss. It was a Tuesday afternoon and the sky was gray with heavy clouds. The rain was torrential; wind billowed from all directions and roads were overrun by water. The conditions were perfect for testing out the Arcadia II’s resiliency, so I called up a fellow adventurer. I bribed him with the promise of a celebratory Taco Tuesday date under the condition that he help me do exactly what TLC warned us not to do: go chase waterfalls. We met at a trailhead at Wildwood Park in Thousand Oaks, home to the locally famous Paradise Falls. It was nearing 50 degrees outside, so I layered a long sleeve baselayer and a fleece underneath the Arcadia II. The jacket has zippered pockets that easily stashed my essentials. I’m not soaked, but the land is. The hike was nothing short of a slippery mud walk. The wind pelted rain onto my face and I was able to secure the jacket around my head, attempting to keep my hair and ears dry. At this point in the date, I still made meager attempts to look presentable. Hood down and hem adjusted for full storm protection. We splashed, clomped, and slid our way on the trail until we neared our destination. The waterfall exploded out of the side of the mountain. At the base of the falls was a group of fellow hikers standing on rocks in the creek, taking swigs from a flask. With enthusiasm, we joined their celebration. Paradise Falls. Sometimes you got to get wet. Somehow I maintained my balance on a muddy rock about fifteen feet from the falls. For five minutes I was drenched with water that came at me from 360 degrees. The waterfall, the rain, and the creek all reached out, hoping to soak me down to my bones. My leggings were drenched, my socks were soppy, and my hair was a long lost cause (I didn’t strap the hood down properly), but my torso was bone dry. The Arcadia II was, in fact, watertight. On the way back we got lost…I mean, took a shortcut in the dark and found an unfamiliar trail that led to a cave. While in the cave we noticed an opening that led us in the direction of the parking lot. In dry, sunny conditions the sandstone rocks are easy to climb with secure holds. However, in the rain the holes are muddy and unpredictable. Some may say sketchy. So, naturally, we took this sketchy route, which in turn helped test the ruggedness of the Arcadia II. After wiggling my way through the cave opening, my hands buried into the muddy earth and body scratching against immovable rocks, I was pleased to see that the tough nylon shell of the jacket was unscathed. The Arcadia II dried off nicely and did not show evidence of my muddy adventure. After eating my fair share of chips and guacamole post-hike, I threw the jacket in the laundry machine. It came out clean and undamaged, ready for future rainy-day dates. Just note that the jacket will be very soppy after a wash, and to protect the material it’s recommended to air dry. A rain jacket that keeps you dry in the face of a waterfall is one thing, but a budget jacket that doesn’t get dirty or show wear easily takes it to a whole new level. After the first wear I sat down and started to inspect the Arcadia II because it has many features that are worth getting to know. The nylon shell is soft and flexible, much more so than I thought it would be. The jacket also uses Columbia’s Omni-Tech fabric, a proprietary technology that is their version of waterproof breathability. Omni-Tech has a permeable membrane that allows for breathability, but is used in a two-layer construction for the Arcadia II. It shed water well enough, but was not all that breathable. Omni-Tech logo on the sleeve in the picture on the left. Solid hood profile, too. The two-layer construction means there’s a mesh lining covering most of the inside of the jacket. This is comfortable to a degree, but the sections of the jacket without the mesh, like the sleeves, got really sticky. Mesh interior on the right is 2-layer construction. Helps with breathability, but is missing in a few places. Velcro cuffs on the left help to keep water out of your wrists. The front zipper glided smoothly throughout my testing and is protected by a hook and loop storm-flap. This kept water from leaking in through the zipper, which is critical. The Arcadia II easily packs into its own pocket and can be stashed conveniently. The pockets are also roomy hand-warmers with zippers. I recommend wearing a comfy fleece underneath because the jacket runs large. I took this to mean it was ready for lots of layers. Zippered hand-pockets can hold a lot. You can even stuff the Arcadia II inside for quick stashing. The Arcadia II’s sleeves are long, reaching to the middle of my palms, which is handy in wet conditions. The velcro straps around the wrist are a convenient way to tighten the sleeves, preventing any water from getting in. After raising my arms to the rain gods at the waterfall I was upset that my wrists and forearms were soaked, but after the fact I realized that I could have prevented this by strapping the velcro down tightly around my wrists. I know, rookie mistake. All in all, the Arcadia II is an impressive rain repellent for casual, daily adventures. While crinkly, the Arcadia II is soft and less stiff than a lot of other water-repellent gear I’ve used. The jacket was cuddly enough to wear while lurking in coffee shop corners writing this review, but unfortunately, is not quiet enough for stealthy ninja attacks. Comfortable yet crinkly for most activities. The Arcadia II and I are still getting to know each other, but with proper care and respect, I know this jacket will last many years, assuming I do not squeeze through cave openings regularly. The Omni-Tech is successful at keeping off dirt and grime. I was almost disappointed with how clean I looked after my waterfall adventure. The jacket is lined with a light polyester mesh that holds the water-repellent shell away from the skin. Wear a liner, especially a long sleeve, because the lower portion of the sleeves does not have mesh lining, and your skin will get sticky and hot. Also, keep your cardio output low, unless you are looking to steam up like a bag of veggies. Not the best for breathability. The Arcadia II has decent, if basic waterproofing for a rain jacket. The jacket is properly coated in DWR, and the material won’t let rain in. However, the cuffs closures aren’t 100% secure and the hood doesn’t extend enough for full protection. It certainly works, but won’t blow you away. The Arcadia II has a boxy shape but does not drown my figure while wearing a Medium. I am 5’6’’ with a shorter torso and wider shoulders, and the jacket does not pull tightly at my arms. It can be tightened around the hips with elastic drawstring if needed. While zipped up with two layers underneath I was still nimble as a ninja. That’s all for the women’s jacket, but the men’s is also cut to a larger, boxy shape to allow for easy layering. The Arcadia II is a simple, utilitarian jacket design with minimal flare. For those who prefer practicality over pizazz, it’s a solid choice. For those who prefer practicality and pizazz (just a little), the Arcadia II is offered in a huge array of colors. But the fit doesn’t change, so while this jacket may not be the first choice of outerwear for a hot date on the town, it’s certainly attractive enough for a hot date on the trails. Styling, to say the least. Also, yes, in California you need both your sunglasses and rain jacket on any given winter day. Any piece of gear has issues, and that’s especially true with budget-friendly gear. With a mesh interior lining, the Arcadia II has less-than-stellar breathability. The interior material of the arms is not lined, which can be sticky and uncomfortable at any instance of perspiration…not that I sweat or anything. Initially, I felt the jacket was underpriced, finding the quality and features to be abundant. After many adventures and urban treks I would price the jacket for what it costs. The fabric, while soft and water-repellent, stays crinkled after stashing the jacket in its storage pocket. When wearing the jacket around town I felt that the crinkled-look lessened my professional appearance (it’s all smoke and mirrors, guys). I kept the jacket hanging up in my closet because it kept the material fresh and sharp. To some, this detail won’t matter. To others it’s a deal-breaker. The Columbia Arcadia II is an ideal companion for everyday adventuring when rain is falling from the sky. Tested in rough conditions, this jacket will keep you dry in case you find yourself trapped in a crazy tsunami while running errands. Just remember to zip up and strap down! The Columbia Arcadia II rain jacket was tested for this review, in a women’s Medium. It’s also offered in a men’s version, which is called the Watertight II. The jackets are the same except for fit and color choices. You can find both jackets below. They’re often on sale, so we recommend grabbing one at a discounted price!